"On any September day, this grizzly bear might be spotted enjoying the nourishment and taste of the fully ripened clusters of black cherries. Although chokecherries provide humans with delicious syrup, wine, and a dark marroon-colored jelly, they are more important as a source of food to wildlife. Growing along waterways throughout most of the United States and Canada, chokecherry bushes sport small, white flowers which hang in sausage-shaped racemes throughout the early months of summer and then ripen before the fall. Though the foliage, bark, and pits contain cyanide, they are eaten with no ill effects by many birds and animals in the wild. "I like to watch the face of someone trying chokecherries for the first time. They have a unique taste which creates an acute dryness in the mouth - hence their name. 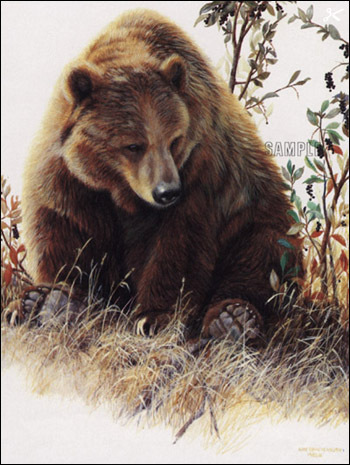 Enjoyment of chokecherries straight from the bush is an acquired taste, one which this bear would prefer you not to try to cultivate, leaving more berries for him." 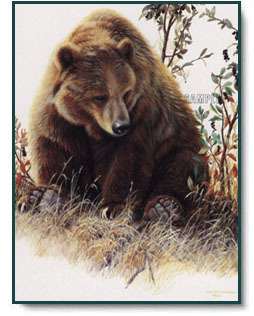 Grizzly in the Chokecherries copyright © 1984 by Amy Brackenbury.